There is nothing better than a cool, refreshing drink on a hot summer day! 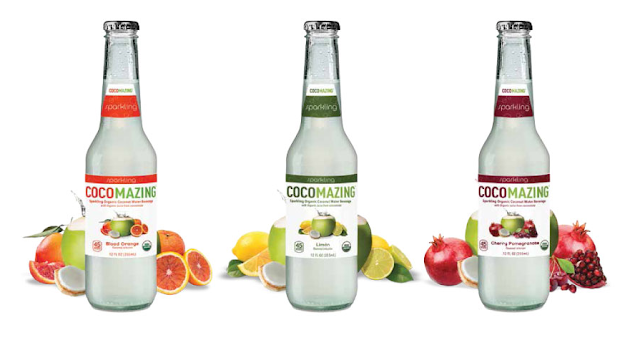 And this summer I am so happy to be able to reach for CocoMazing, the first-ever sparkling organic coconut water. At only 45 calories, CocoMazing is available in three flavors: Limon, Blood Orange and Cherry Pomegranate. These blends of sweet and tart flavors combined with carbonation result in a refreshing and unique coconut water blend with remarkable taste, reliable nutritional benefits and an enjoyable drink. CocoMazing is GMO-free, gluten free and uses no preservatives. Cocomazing™, Organic Sparkling Coconut Water Beverage with Organic Juice from concentrate adds carbonation to coconut water-juice infusions, and the result is super-good and fun to drink. With its effervescent kick, Cocomazing is all the benefits of coconut water – with an added ‘zing! These are great for the whole family and my children enjoy having a special drink that tastes delicious and I don't mind them having one because they are organic, has health benefits and tastes great! Cocomazing has an enhanced nutritional profile because it is made from organic coconut water. Coconut water is the revitalizing juice found in young, green coconuts. People have been drinking it for ages because it’s satisfying, beneficial for health, and soooo refreshing! In fact, it’s not just good – it’s awesome. Why? Because coconut water is packed with potassium, electrolytes, and minerals – all essential nutrition for your body. Cocomazing’s three remarkable flavors taste great: Cherry Pomegranate, Limon and Blood Orange. Cherry Pomegranate is a mouthwatering blend of the sweet and tart flavors of these terrific fruits. Limon features a subtle twist on the common tartness of lemon lime fruit combos. Blood Orange gives a distinctive sweet, less acidic, orange taste. All three flavors go beyond being merely satisfying, they are truly invigorating. I really like these and so does our whole family! The delicious taste really impressed me and these are even great for cocktails! I recommend them for the whole family this summer as a refreshing drink! You can purchase Cocomazing at a local retailer.